Most people know about the amazing ways in which computer technology has transformed the world in the last 20 or 30 years. Tablets, smart phones and home automation devices have made every aspect of our lives easier and better. This fact holds true not just for the Internet but healthcare as well. One great example of what we mean is the breakthrough advances occurring in the science of dental implants. Anyone who has researched implants knows that the key to this type of dental restoration lies in the way the implant integrates with the patient’s body. 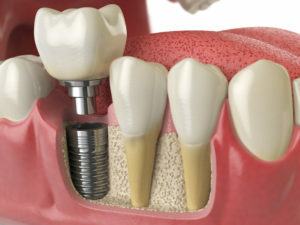 In the small number of cases where implants fail, the cause can usually be traced to a problem with the underlying bone. This problem is rapidly being resolved thanks to new therapies that match the implant to the recipient with newfound levels of comfort, precision and reliability. The benefits for dental patients include faster recovery times and superior long-term results. One concern that has troubled implant recipients in the past was how well the restoration would blend in with their natural teeth. Groundbreaking developments in digital imaging technology enable today’s dentists to create implants that match the patient’s oral profile exactly. The results are a thing of beauty, both for dentists and their patients. There will always be a period of recovery after implant placement. This is one of the unalterable fact that accompanies any form of surgery. The good news is that recovery times are getting shorter, thanks to new placement methods developed in the last few years. This means that patients will be able to enjoy the advantages of implant therapy sooner than ever before. How would you like to see what your new implant will look like before you undergo surgery? That’s now possible thanks to what dentists are calling “digital smile technology.” Your dental professional will prepare high definition images that show precisely how you will look after the restoration process is complete. You’ll never again have to worry about what you’ll look like afterwards. X-rays are essential for performing almost any type of dental procedure. But modern imaging technology has greatly reduced the amount of radiation needed to obtain accurate images. This means that implant dentist can now offer their patients added peace of mind as well as better results. In the past, certain medical conditions have required the implant recipient to undergo extensive bone grafts to support the restoration. While this is still sometimes true, in many cases dentists are able to regenerate the existing bone. This avoids the need for multiple procedures and spares the patient from needless discomfort. While some patients only need one or two implants, others require a more extensive therapeutic approach. This is easier than ever, thanks to stronger materials that can support both full bridge and full denture restorations. These are just a few of the ways in which new technology is making implant restorations better than ever before. Make an appointment to see your implant dentist soon. What you learn will put a big smile on your face. Doctor CJ Landry has more than three decades of experience treating dental patients. He earned his DDS degree from Louisiana State University in 1982. He has completed thousands of hours of additional training in implant dentistry, orthodontics and dental surgery. You can reach his office online or by calling (504) 348-0080.